MUFF WIGGLER :: View topic - What does your Ambient rack look like? What does your Ambient rack look like? This is in addition to a 0-coast, and an analog 4 which I use mainly for sequencing/effects/audio interface. (I might part with the 0-coast, its sound is a little too harsh for my taste). I think my love of modulation may have caused me to neglect modules that work more with audio, like VCOs, filters, and effects. 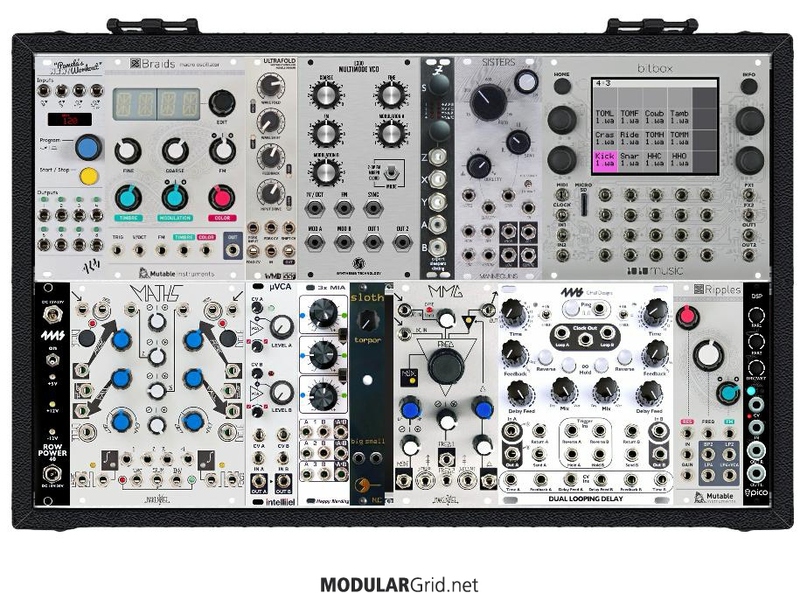 Anyway, I was wondering if any ambient music makers would post their setups and talk a little about their favorite modules or aspects of the rig. I am a great admirer of artists like r beny and fourhexagons (AKA Lightbath), and they represent some of my main eurorack inspirations and goals. Thanks for your help and input! Sloths are a good call. I also really like Blinds for mixing modulations and various other tasks. On the sound sources side of things, it's pretty subjective but personally I love my Phonogene and the Verbos Harmonic Oscillator. Looking at your set up, I'd be thinking about a flexible noise source (Dunst maybe) to use as an input for Rings and also to use as a modulation source. Warps (with Parasites) is also really fantastic value. Tides with Parasite firmware or SHEEP firmware. huge amount of possibilities. sine waves. lots of them. I think putting a picture of my own rack might have made my intentions a little unclear. I was hoping current ambient artists would post what their setup looks like currently, and say what they like about it. I describe the music I make as ambient, but there is so much territory covered under that name. I tend to aim for lighter rather than dark, melodic rather than atonal or disonant, and lately doing more drone styles, although I also like enveloped/plucked tones. 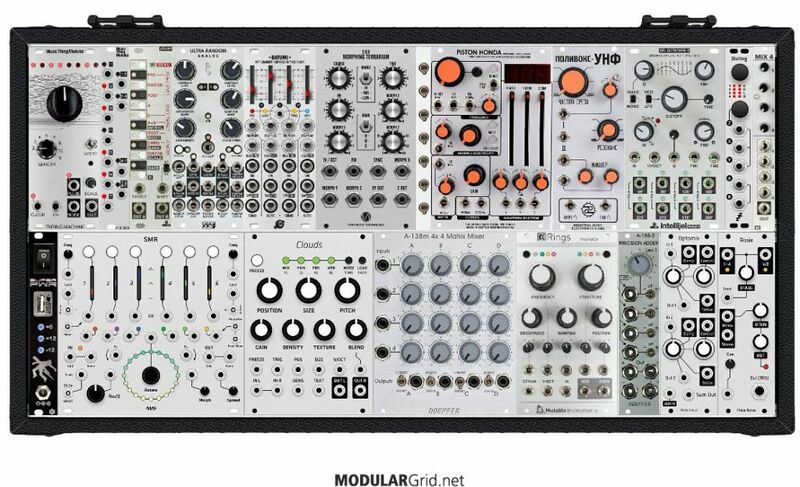 As far as favorite modules, right now the Spectral Multiband Resonantor is a biggie, I've had it about a month and I am deep into exploring it's capabilities. Firmware v5 lets it control up to 6 other VCOs which are mapped to the 6 notes of the scale you have dialed in. This has been a blast to play with. Since getting it, I've taken to using Rene's touchplates to "play" the SMR, sending the Unquantized CV out to the rotate in. You can then use the QCV for something else, including into the "spread" input on the SMR, or a different osc. Clouds is great (mine has the black magpie face which is why it might be hard to spot), but as noted a million times, CV attenuation is key to hitting sweet spots with it. Also, to add character, the ZVEX Instant Lo-fi Junky is nice, feed it a pad and you'll get a slight warble in it like tape flutter. It's nice that you can patch in your own LFO shapes into the "Wave in"
Also Three Sisters gets used a lot. Awesome! this is exactly what I was thinking. Light, ethereal, melodic ambient is exactly what I'm going for. Although I do like adding a little crunch, somewhat like jefre-cantu ledesma. Very cool to hear about the SMR, that one certainly seems like a strange, yet awesome module for extracting and creating harmonics. I'd like to hear more about how you use the 3 sisters. It seems interesting no doubt, and likely very helpful for filling a balanced mix, but I'm a little unsure of just how it is used practically. I most often use it to kind of "morph" tonally through the 4 inputs (although one input is is sent through all the outputs). I'll feed it diffferent melodic lines, or sometimes copies of the same melody that are already filtered differently, and move between them, usually by manually turning the frequency knob, the span knob or both. It's a bit of a hit and miss approach as sometimes you'll get one of the inputs resonating too much (distorting or dominating the mix). I recently got a stereo mixer (the Erica Stereo mix) so I can send those outputs into different channels, or mix pairs of outputs down to two channels first. Sometimes I'll use it as a more trafitional filter putting envelopes or other CV in via the frequency jack. Triple Sloth for long / slow modulation cycles. I’m in the process of putting together this live rig for some ambient shows. The layout needs more thought - just waiting for a 6u 84hp case to turn up in the post so I can spend time on the configuration. Planning to have the Bitbox pre-loaded with clips to jam with, with the outs routed to an external mixer (using two complimentary outboard reverbs - Bigsky and Wedge). The rest of the case will be used for improv (synchronised to the Bitbox clips with Pam), and as a beefy mixer/FX box for mangling together all the sound sources. Only had the new Pam a few days but it seems perfect for dialing in precise modulation presets which are great for jamming with. As mentioned above, wouldn’t be without a Sloth either (wish I had the triple). There’s a bunch of stuff that won’t be going out to gigs that I’ve relied on heavily for making ambient tracks - namely Clouds, Mysteron, Mangrove, Just Friends, Basimilus Alter, Batumi and Stillson Hammer MKII. My current system. Having 2x Clouds is great. I usually have one running in granular mode and one in looping delay mode, though I'm a big fan of the Oliverb, Resonator and the Time-Stretching/Pitch-Shifting mode. The looping delay mode on the lower quality settings is fantastic. Longer delay times with feedback can get some Basinski-esque tape degradation sounds. I like the sound of the overdrive/distortion when gain is all the way up. The texture knob becomes a filter and it's useful for shaping the tone of the distortion. Can get Jefre Cantu-Ledesma-like sounds. The Doepfer A-189-1 is a beaut. Dunst is great. Rustyjaw, your music and photos are amazing. Instant fan. wildfrontiers, your music is a huge inspiration to me and I'm sure lots of others. I'm just starting out, trying to emulate some of the sounds I hear, but find it frustrating as I don't seem to really get how to make modules like clouds do what you guys are doing. I do have a better understanding now of one way to use the SMR and will have to spend some time on that. Thanks! I have a similar rack to yours. I really like the 4ms RCD paired with rings going into the strum input. Then use an lfo to rotate the clock divisions. You can get a nice generative pseudo random style rhythm going this way. @rustyjaw Cool rack man! How do you like that Sisters filter for this type of music? I'm thinking of getting one. Theee Sisters is a great filter for ambient music in my opinion. 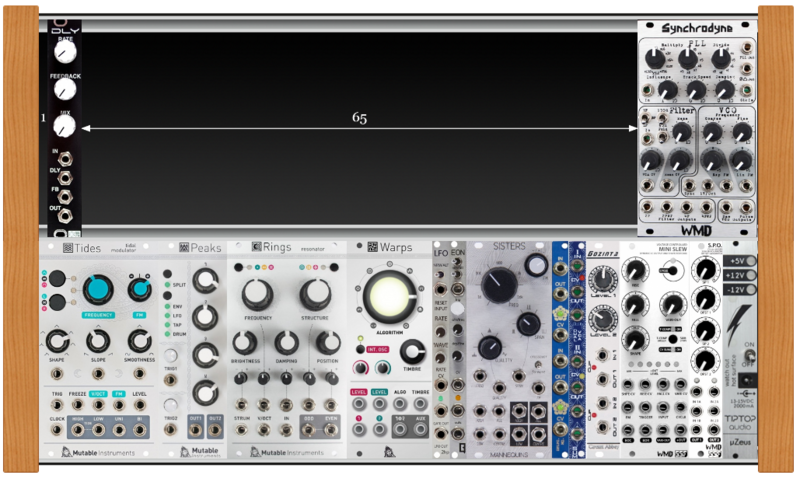 Theee things that I love for making ambient in my euro setup are the intellijel Rainmaker (which is huge I know... but also adds a massive amount of possibilities well beyond any delay out there) and the audio damage Æverb II (the euro version of their EOS plugin is on the way which I'm super excited for). The final thing is Frames by mutable instrument. So amazing for slowly evolving patches. I may be way off here (I still consider myself a noob), but does it really matter? 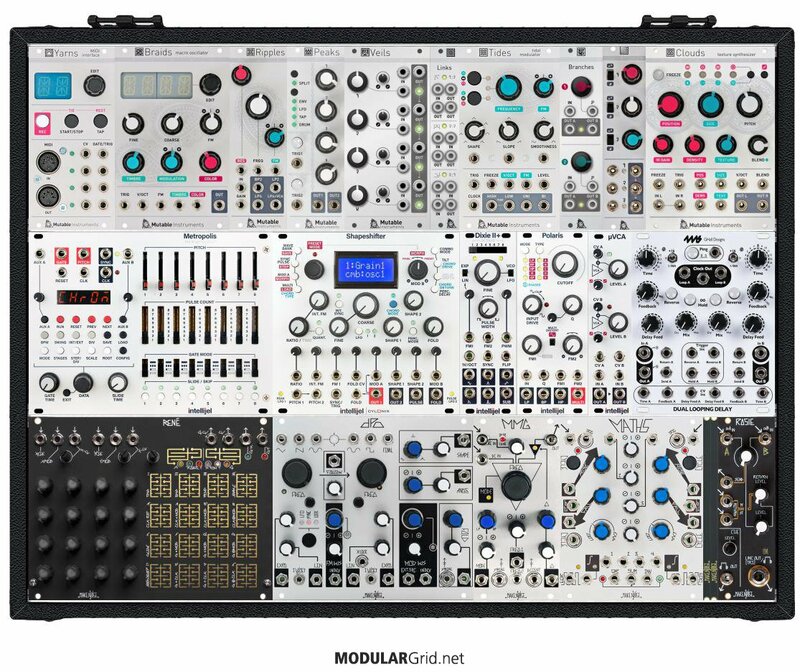 (OK, let's exclude dedicated drum modules.) The same modules I use for techno I use the next day for ambient. I would use a Sloth—or in my case a Benjolin in LFO mode—to modulate the filter cutoff of an acid loop for variations over a song timescale. 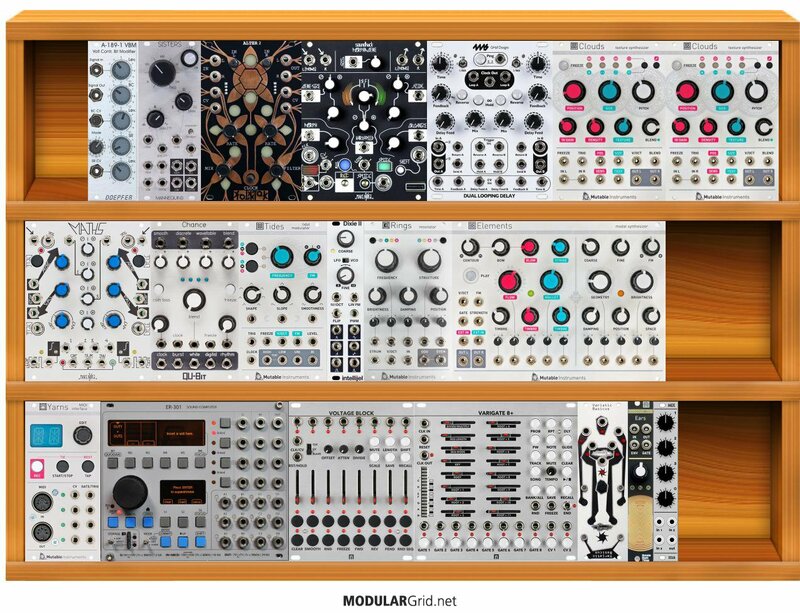 But I think for the most part, ambient is how you tell the modular to play. I'm sure a lot people could use my setup to make very upbeat music, and I could make ambient music with a rack that someone uses for mostly only techno or upbeat stuff. That's a take on a eurorack performance style I don't think I've seen yet. Very cool. Wow, thanks for the input! I have yet to try the other modes much on clouds or install parasites, as I have wanted to get as much out of the granular mode as I can in pretty much every patch, but I am definitely planning on diving into the other modes eventually. I''l check out that A-189 too, bitcrushing is great. I have noticed that my rings has been wanting an exciter, and the rainbow and dunst definitely seem great for that. Verbos harmonic + just frineds also seems AMAZING. I have noticed that the DLD seems to be pretty ubiquitous among these racks, and I definitely have been eyeing it. It is however pretty expensive. Another module I've been looking at that I haven't seen on anyone's rack here yet is the Roland Aira Demora delay. It also has stereo and clockability. The DLD definitely has a few notable advantages over the demora as a delay, such as the actual dual nature of it (instead of just stereo), the freeze, reverse, etc. So I guess what I'm wondering is how often everyone uses these features on the DLD, versus using more or less like a normal stereo delay? The benefits of the Demora in this case is that it is about half the price (on clearance) and it has the programmabilit aspect, allowing it to have tons of flexibility. :shrug: I make ambient sometimes... usually dark and/or noisy though. Other times I do rhythmic stuff, or drones, or powernoise or whatever comes to mind. This plus a 0-Coast and Microbrute, a few small desktop synths (Kastle, Olegtron 4060 etc) and lots of software. Also I have a Lifeforms Mod Tools preordered and will be picking up a Disting Mk4 as soon as those are available. I take care of sequencing, effects, samples and most drums (when I use them) in software. I might add one more interesting VCO (if it does fun LFO shapes), and maybe a small filter/LPG, but mostly I'm looking at more modulation. Probably an Ornament & Crime next (with an eye toward replacing Peaks), and Batumi and Frames are on my radar. Sounds exactly like my music, so I had to check your youtube out. Turns out it's a bit different, but I like it alot! Thanks for sharing! 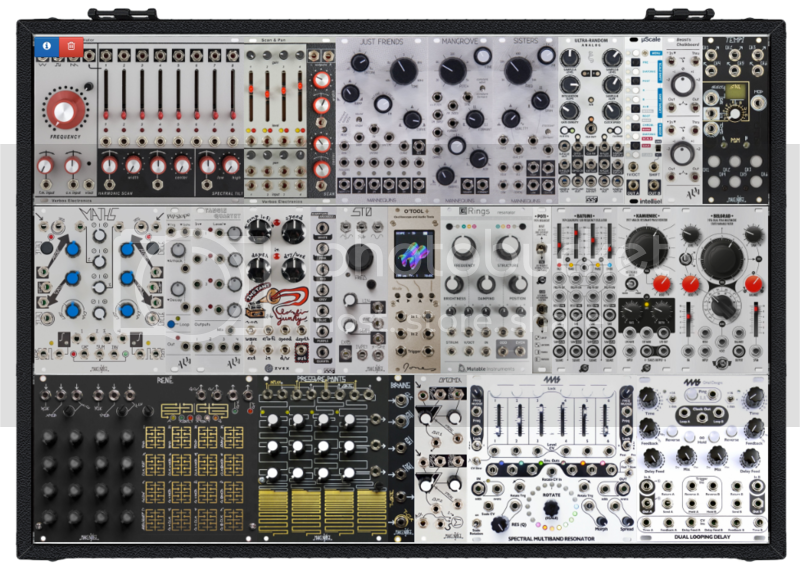 this is my 6u (down from 12) that i put together recently for some live sets i am planning. for some floaty stuff, i really enjoy hitting all the bands on the smr (with that new 2x res filter) with the pulses from the turning machine (using a slow oddball/skittering clock) with the morph maxed out and into rings in its easter egg mode with a huge verb trail... then quick cut the morph to zero and flip rings into its formant filter mode for some cool/woody, melodic percussive-ish stuff. and yeah, wildfrontiers hit the nail on the head with the 189-1. great for adding a little grit when you need it. Thanks for the kind words. You and I both are big fans of R Beny. One thing to keep in mind is that, at least for me, every patch that makes it to a recording is preceded by many that end up being "learning experiences." It helps me to think not of what amazing patch I can build, but more about what new thing can I try to learn. Sometimes that simple goal ends up leading to a whole patch. But if it doesn't, at least I've learned something and don't feel crushed that I've failed to make something amazing. I'm familiar with that feeling of failure, but its really very counterproductive, literally. As far as the SMR, read the manual (I read it cover-to-cover twice), and watch videos, including the 4MS ones. It's a deep module and is more flexible than it might first appear.